Secure VPN connections for desktop, laptop or tablet PCs running on Windows operating systems 10, 8.x, 7, Vista or Windows Mobile. 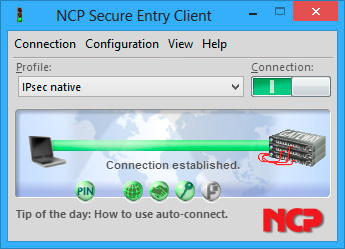 The NCP Secure Entry Client for Windows is a component of NCP's Next Generation Network Access Technology. Being a one-click solution, the IPsec client software automatically selects the appropriate firewall policy and the best possible communication medium, controls internet connectivity and initiates the setup of a VPN tunnel. A centrally defined parameter lock prevents intentional or accidental configuration setting changes by users. Recommended for organizations with up to 50 remote access users and without a requirement for central management. The VPN software is compatible with all common IPsec VPN gateways and can also be used with Microsoft Windows Server 2008 R2 as it supports IKEv2. Pre-shared secrets, one-time passwords, and challenge response systems; RSA SecurID ready. Revocation: EPRL (End-entity Public-key Certificate Revocation List, formerly CRL), CARL (Certification Authority Revocation List, formerly ARL), OCSP. 1. From version 9.3 onwards, all NCP Secure VPN Clients (Win32/64) support Windows 8 in 32 bit and 64 bit mode - naturally, in addition to Windows 7, Vista and XP. For Windows 8 support you will need a 9.3 license key or higher. Which client software does NCP offer? NCP offers Secure Entry clients and Secure Enterprise clients for universal access to central data networks. Both support all security technologies (VPN, PKI) and use the same communications and security standards. The latter can be administered centrally and can be bundled with the NCP Endpoint Security concept. What do I have to consider when updating from Windows 7 or 8 to Windows 10? When updating from Microsoft Windows 7, Windows 8 or Windows 8.1 to Microsoft Windows 10, it is vital that the NCP Secure Client be uninstalled before starting the update. At the same time it is recommended that the configuration file, as well as the certificates used, is saved separately. After the Upgrade to Windows 10 is completed, make sure to install version 10.02 (or later) of the NCP Secure Client as previous versions are not supported for Microsoft’s most recent OS. Please note that a license key version 10.0 is required to run version 10.02 of the NCP Secure Client on Windows 10. What do I have to consider when updating from Windows 7 to Windows 8? Under certain circumstances , when the operating system is upgraded from Windows 7 to Windows 8, the NCP Secure Client no longer works after the upgrade. In such a case, download the latest version of the NCP Secure Client from the NCP website and install this over the existing version of the Secure Client; afterwards the Secure Client software should work correctly. What do I have to consider when updating from OS X 10.10, 10.9 or 10.8 to OS X 10.11 El Capitan? If the NCP Secure Client for Mac is installed on an older operating system, e.g. OS X 10.10, and you update to OS X 10.11 El Capitan, an error message could appear indicating that the NCP Secure Client cannot access the log. The user can fix this malfunction by entering the following command in the command line: sudo chmod 777 /Library/Logs/NCP. Otherwise you can uninstall the NCP Client before the update and install it again after the update. Is the NCP Secure Mac OS X Client release 2.02 build 14 compatible with the Mac OS X 10.8 Mountain Lion operating system? In priniciple, the NCP Secure Mac OS X Client release 2.02 build 14 is compatible with Mac OS X 10.8 Mountain Lion. However, the "Gatekeeper" security feature, newly introduced with Mountain Lion, must be disabled before starting a new install or update of the NCP Secure Client. Before starting the install routine, the OS X System Preferences must be modified: under "Security & Privacy/General" temporarily change the setting of "Allow applications downloaded from" to "Anywhere". As soon as the installation or update is complete, the "Gatekeeper" parameter can be changed back to its previous value. No further changes are required, not even after a restart of the machine. Which operating systems and end devices does NCP Secure Windows Mobile Client support? The supported operating systems for the NCP Secure Windows Mobile Enterprise Client can be found in the data sheet. The supported operating systems for the NCP Secure Windows Mobile Entry Clients can be found in the data sheet. Does the NCP Secure Client support Symbian 3? NCP currently offers a VPN client for S60 3rd edition. Owing to the current situation - liquidation of the Symbian foundation, withdrawal of large suppliers like Samsung and Sony Ericsson - NCP still reviews its support of the new operating system Symbian^3. NCP closely monitors the respective market and reserves the right to act according to the demands of the market. Will Android based devices be supported by the NCP SSL VPN solution? Is there an NCP Secure Client for Android? Does NCP support the VPN Client pre-installed in Android devices? Yes. Those Android based devices with the works-installed VPN Client can use that VPN Client to establish a VPN Tunnel to NCP Secure Enterprise VPN Server (from version 8.05). The protocol used in such a connection is L2TP over IPsec. Will iOS based devices (Apple iPhone/iPad) be supported by the NCP SSL VPN solution? Is the NCP Secure Client supported on Apple iOS? NCP plans to provide Secure Clients for Apple iOS. However, due to technical restrictions imposed by Apple, NCP is not currently able to develop Secure Client versions for this operating system. The required information from Apple is not yet available. Does NCP support the VPN Client pre-installed in Apple iOS? Yes. Apple iOS, from version 3 onwards, includes an IPsec VPN Client which can establish a VPN Tunnel to an NCP Secure Enterprise VPN Server. Is the NCP Secure Client supported on Windows 8 RT and Windows Phone 7/8? Currently NCP provides VPN Clients for Windows 7, Windows 8 and Windows Mobile 5/6.x. For the other Windows OS we provide our SSL VPN solution (Web Proxy). NCP also plans to provide IPsec VPN Clients for Windows 8 RT and Windows Phone 7/8, Microsoft’s new operating systems. However, due to technical restrictions imposed by Microsoft, NCP is not currently able to develop Secure Client versions for these operating systems. The information required from Microsoft is not yet available. Does the NCP secure client also work with VPN gateways from third-parties? Yes, based on the IPSec standard, incl. all RFC protocol enhancements (XAUTH, IKEConfig, NAT-T). Is there a way to easily import client configuration files from other vendors? Yes, you can automatically import .pcf, .wgx, .spd or .ini files. I'd like to set up a (really) secure VPN connection without being at the mercy of the Internet or public WLAN. Is that possible with the secure client from NCP? Yes. NCP secure clients have an integrated, dynamic personal firewall and support FND (Friendly Net Detection). How do I update my NCP Software? Minor releases contain error corrections and minor improvements. Where can I find the information of the current version I use? You can find the information at the Client Monitor. Click on "Help" at the menu bar and choose "Info". What are the differences between NCP Secure Entry Client, NCP Secure Enterprise Client and NCP Secure Client - Juniper Edition? All clients have a similar range of features, but the NCP Secure Enterprise Client can also be administered centrally. Do I need a personal firewall at my tele-workplace as well as the NCP secure client? No. All VPN clients from NCP have an integrated personal firewall which can also be administered centrally in the case of the Secure Enterprise client. Can I save my company logo or a project logo to the Client Monitor and if so, how? Both Secure Enterprise (Win32/64) as well as the Secure Entry Client (Win32/64) offer the option to save your company logo in a dedicated monitor field. An additional information field is displayed as standard in the Secure Entry Client monitor. This can be replaced or removed. An HTML file, saved in the local installation directory, is displayed in the web browser after a mouse click on this field. You can find all the information about saving your company or project logo. Yes, you'll find details in the PDF "Entry Client Firewall and FND"
How does the NCP client provide secure Hotspot logon? Yes, you'll find details in the PDF "Entry Client Mobile Computing"
Does the NCP solution address the issue of overlapping IP networks? Is there a possibility to lock the settings for VPN, Internet Access and Personal Firewall in order to prevent users from misconfiguration? You'll find details about the NCP Secure Entry Client in the PDF "Entry Client Monitor"
You'll find details about the NCP Secure Enterprise Client in the PDF "Enterprise Client Monitor"
What happens if you unplug an external certificate storage device (e.g. smartcard, USB flash drive, SD card)? The VPN connection is immediately and automatically disconnected if the default setting is still in place. If the VPN connection is to remain, you can configure this specifically. Do NCP's Secure Clients support WWAN Hardware (Wi-Fi, 3G) with NDIS 6.2 driver for Windows 7 (e.g. Sierra Wireless, Huawei, Option)? Yes, they do. The architecture of NCP's Secure Clients allows for a smooth VPN connection. Which ports and protocols are used for IPsec? Download the NCP Secure Entry Client for Windows 32/64 bit Datasheet (PDF). Download the Software Activation NCP Secure Entry Client (Win32/64) Document (PDF). For more than 50 users, please use our Quote Request Form!